People who enter this plane of existence traveling on Life Path 9 have a life focus built around compassion, generous attitudes toward others and dramatic emotions. A strong humanitarian side can affect every aspect of your life and being. Even the most inconsequential people to the workings of the world at large have copious amounts of compassion and a drive to make a difference in other people's lives. These Path 9 people often have a very great sense of honor and can be trusted in all things. Any prejudicial feelings are virtually nonexistent in their lives. The attraction to helping others in less fortunate circumstances can be an overwhelming drive in your life. While it is not possible to solve the world's ills on your own, your deep feelings toward other people will influence you to seek out ways which you can help if you are in a position to do so. 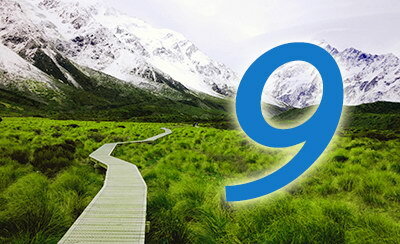 The lofty position of the number 9 among single digit numbers translates into a higher placement on the chart of a personal sense of responsibility to others. While some of you on Life Path 9 can realize material blessings, the quest for money, property or power is not one of your great interests or goals. If financial success does come your way, you are less likely to live a lavish lifestyle because you will be using your assets to help other people instead of yourself. Money is not the goal, but instead a means to an end. Some extreme examples of Life Path 9 individuals include people who give up all their worldly possessions for the goodness of mankind at large. They may give large amounts of money to charities or formal organizations for humanitarian or aid work. Not only are people on this life path usually very generous, they are also quite engaging and pleasant to be around. Their generosity of material things translates to a generosity of self and spirit as well. Every Life Path has negative aspects as well. Number 9 is no exception. Being selfless and giving generously to others can be difficult for many people and some fight their natural inclination because they do not understand that succumbing to these generous feelings can be highly rewarding in itself. The reality of life often contradicts this idea, and 9 Path people need to be careful to focus on the positive aspects of their tendencies rather than at the contradictions.